My kids and hubby had seen it but I just had a chance to watch Big Hero 6 for the first time over the weekend last weekend. It’s such a cute movie! Definitely up there as one of my more favorite Disney movies and I’m happy we’re able to add the DVD to our collection as I’m sure we’ll be watching this one again. 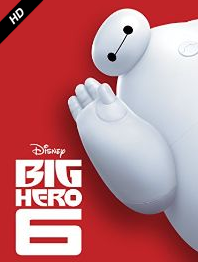 Big Hero 6 released today – you can get buy it digitally on Amazon for $14.99 or $19.99 (SD or HD) or on DVD for $14.99.